bacon print miz mozelle dress. i specifically wore this dress on this day because we went to a local barbecue place for dinner. it’s called mr. bacon’s & it’s only open for dinner once a week for two hours. i’ve never been a big barbecue fan, but this place is AMAZING. they are also one of only two restaurants i have ever been to that managed to produce yummy macaroni & cheese. (the other is mr. bartley’s in harvard square.) the food doesn’t look like much when it comes out, & the whole restaurant is basically cubicle walls plastered with cartoon pigs. but then you taste it & you never want to eat anything else. the other great thing about this dress is that it has an elastic waist, so i had lots of room for pulled pork. sadly, maple sriracha pretzels (which seem to just be rold gold pretzels tossed in maple syrup & hot sauce but SO DELISH) weren’t on the menu this evening. a note: this pattern is actually designed for knits. 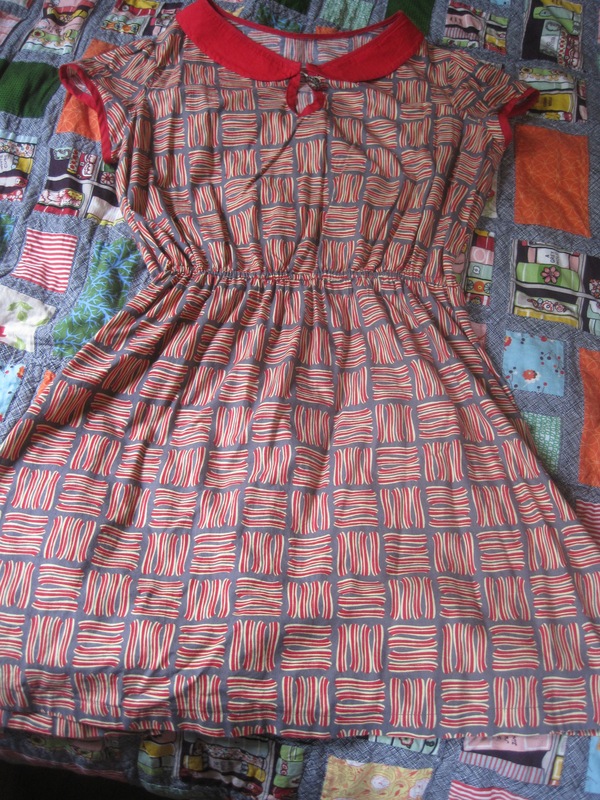 i didn’t realize that until after i made the dress because i saw it on the hart’s fabric blog made up by someone who had done it in a woven, who never mentioned that it was for knits. i’ve never made it in a knit, but i bet it would be supreme comfort. black brontë tee with pink buttons, vogue 1411 black denim pants, turquoise tricot butterick 6031 undies, & black/black cherry elan 645 bra. it was a little bit brisk & A LOT stormy today, so i went for pants. i also just finished sewing up the tee in the morning. at this point, i bet the only person who has more brontë shirts than i do is jennifer lauren herself. sorry not sorry. this one is my fave. the fit is spot on. the undies are new too. note that they have a pink flower instead of a yellow one. now all my tricot scraps are used up, though i accidentally cut the back of these on the crossgrain. they’re still wearable. also, i learned today that if you go into hancock fabrics with an expired coupon, they just hook you up with a new one & apply it to your purchase. nice! flannel jammies for sleeping during the thunderstorm, jellyfish print mccall’s 6887 sailor dress, & black self-drafted tap shorts. the tap shorts are also new & i love them. they’ve been doubling as jammies when it’s hot out. anyway, i wore the dress out on a family walk in the morning. ramona wanted to ride her balance bike & jared & i wanted pastries & coffee. i instantly spilled coffee all over myself. it remains to be seen if the dress is ruined. i also did not notice that after i put it in the wash pile, ramona threw in a brown marker with no cap on it. so there’s also a big brown ink stain on the dress. it was a crayola washable marker. we’ll see how washable they really are. floral lady skater dress & black butterick 6031 undies. the undies are also new. they’re made from silk jersey. so comfy. it was really hot & humid today so i just wanted to wear something light & comfy. a friend came to visit & she said, “you made that dress? it looks like it came from a store!” why, thank you. this was also a good outfit for sitting around & sewing. i’m trying to make a swimsuit & have run into a few issues. 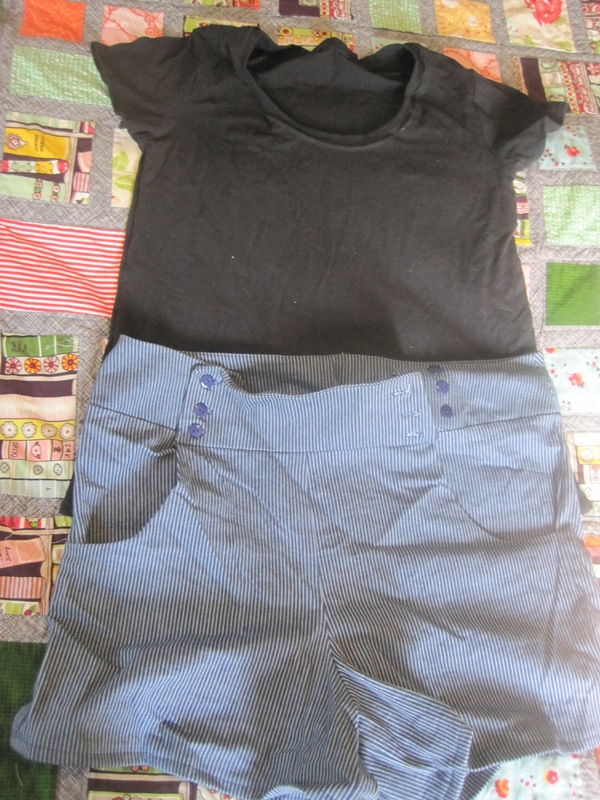 black plantain (in cotton jersey, lighter than the version i made from rayon jersey) & railroad stripe sailor shorts. long weekend is over, so i was back in action as full-time mom. i was nervous about wearing this outfit because i hadn’t worn the shorts yet & you know. when you’re wearing shorts that don’t fit right, it’s somehow so much more stressful than when any other garment doesn’t fit right. i had a splitting headache & just didn’t have the energy for any extra worries. but they wound up being totally comfy. ramona rode her bike to the library & back & i walked with her & felt fine. in fact, i’m still wearing them, even though i’m probably not going to go out again today. i didn’t instantly change into pajamas the second we got home from the library. that’s the mark of a garment that is really working for me. so. only five days left. i wonder if i can keep this streak of at least one previously unworn-in-may item everyday going. i think i still have at least five summer-appropriate unworn garments stashed away. & i have that swimsuit i’m working on. it’s about half-finished. Previous Postme-made may 2015: part 4: these looks are starting to get questionableNext Postme-made may 2015: part six: the end!